For those in the senior housing business and those considering entering it, one of the most important and growing aspects of the business today is mobility. This opportunity has nothing to do with iPhone or Android Apps. It is the simple business and logistics of transporting seniors to events and places that they need to and want to attend. While developers and architects may envision urban projects with access to public transportation, those types of communities are not common nor are they inexpensive to develop. The reality is simple: there are not enough services today that can provide individualized transportation for seniors. Not only are there not enough services, but consider my parents who are baby boomers. My father thinks he’s the coolest guy on the block with his Chicago Transit Authority (CTA) pass; taking the bus everywhere and living in urban bliss in the Streeterville neighborhood of Chicago. It’s a good thing for the streets of Chicago as my father may be the slowest driver on the face of the planet and he’s in his mid-60s. He is considering trading in one car and having their second car be a ZipCar. OMG. My mother, on the other hand, longs for suburbia and her SUV. She is unabashed by her need for green grass and the parking lot at the local grocery store where she can park in oversized spots because space there is not a problem. While families’ personal preferences are divergent, this shows the importance and personal preferences associated with individual mobility allowing aging Americans to move freely in the world in which they choose to live, when and how they want. Once they age and physical challenges limit their choice for personal mobility in their cars, I anticipate a sense of defeat as they know they are restricted further. The loss of this access to community and social connectivity is tough for the elderly and those who care for them. 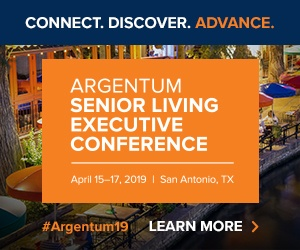 Transportation may not be the sexiest part of senior housing supply chain, but it’s the connectivity to other locations that facilitates life for the 50+ demographic. Technological connectivity may save dollars, but some level of interaction is necessary for medical and social reasons. Until all aspects of medicine can be fully administered electronically, transportation of humans to care facilities will be required. Physical mobility and interconnectedness matter in this digital age. Technological connectedness will not eliminate the need for physical, human contact for either social or medical reasons. As the average age of homes continues to rise in urban and metro markets, the design and infrastructure of suburban America was designed for a more mobile population. This infrastructure was based upon individual mobility, but as age increases, mobility becomes restricted. This puts further strain on the infrastructure in some ways and alleviates it in others. As older drivers come off the road, the streets may be a little less congested and possibly safer. Many architects, government officials and urban planners call for new senior housing in locations that have access to public transportation yet those locations are predominantly in areas that command higher prices. Current trends favor development near hospital or physician groups but it has not become a primary catalyst for new development, more as a by-product. Ride sharing and busing seniors to medical campuses or facilities is a good solution for those living en-masse, not those aging in place. For those not fortunate enough to afford access to retirement communities with various levels of care, transportation services are inadequate to meet the needs of not only today but more importantly tomorrow. The economics of providing transportation are simple: Vehicles, labor, gasoline, insurance. The model does not scale well. Home health care companies and senior living operators will need to develop or partner with existing or start-up transportation services such as taxis, town-cars, and limo services. If seniors who age in place have access to smart phones with apps for taxi services such as Uber, Taxi Magic, etc., they can get those individualized transportation services, but the vehicles and their operators may not have the equipment and expertise. Taxis are common in urban areas but even so, these transportation services are not specifically engineered so that entry and exit from these vehicles is easy. Proximity to mass transit and close access to medical resources may work in specific cases, but the future lies in an affordable form of personalized transportation. This solution allows the elderly to transition from driving one’s own vehicle to assisted transportation and mobility dependency.